Best Materials specializes in the finest quality concrete repair products. We have proven solutions for all type of concrete repairs, including wall and floor crack repair kits, roadway repair / large area concrete repair products, parking lot repair etc. Also basement repairs, foundation repairs, parking garage repairs, underground structures, bridges, tunnels and all types of concrete restoration projects. Help with repair option selection. Our product lines include those from the industries leading concrete restoration suppliers: Applied Technologies, BASF, CME Manufacturing, CPR PRoducts, Master Builders and Polyquik/Williamette. These products are proven in decades of applications and are backed by the nations biggest suppliers and best warranties. They are designed to be cost effective, easy to apply and assure rapid repairs which provide the longest-life. Our technical support experts can help advise you on the best parking garage repair products. And our cost effective shipping and bulk pricing enables us to deliver the lowest cost solutions right to your jobsite. Fastpatch LV (instant-set, low viscosity concrete crack repair & filler. Cures very hard (6500 psi). Can be ground flush. Similar to Emecole 555). Novatuff FC-200 (Formerly AES-200) Epoxy Floor Coating, Gray Color, ESD rated, for food processing areas, basements, garage floor, airplane hangers, chemical storage, etc. Novatuff C-300 (Formerly AES-300) Epoxy Caulking / Sealant. Jet fuel, gas, diesel and chemical resistant. 200% elongation, 90% solids, UV resistant, permanent waterproofing. Waterproofing grade. Suitable for ponding water, above/below grade, underwater repairs. Fills small gaps and cracks. Self priming. Paintable. SL2 (Tintable concrete expansion joint sealant. Kure-N-Harden (silicate-based curing, hardening, sealing, and dustproofing compound). Cracks in concrete generally develop due to shrinkage, temperature changes, ground movement or excessive loads, moisture exposure, rebar corrosion, freeze/thaw cycle or poor materials. Different materials and methods are used for repair of horizontal and vertical cracks in concrete and active vs. dormant cracks. Dormant cracks, use either rigid or flexible repair materials. Active cracks require flexible repair materials and special design considerations to allow for future movements. Cosmetic Repair Crack Routing and Sealing). 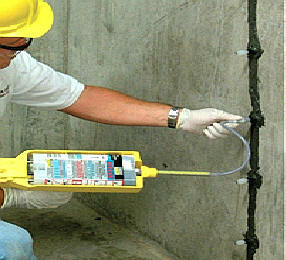 Injection epoxies for cracks in concrete can make both structural repairs and prevent water intrusion. 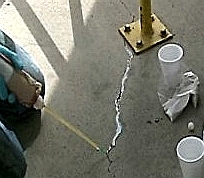 Epoxy injection bonds or welds cracks as narrow as 0.002 inches together and restores concrete soundness and integrity. This method consists of installing injection ports into drilled holes at close intervals along horizontal, vertical or overhead cracks and pressure-injecting epoxy. Cracks injected with epoxy need to be dormant and not actively leaking. While moist cracks can be injected, water or other contaminates will reduce the effectiveness of the epoxy repair. Injection epoxies are two-component, in side-by-side cartridges and are dispensed through a static mixing nozzle using a 2-component dispensing tool. Three viscosities are available to handle a wide range of crack widths. Properly installed, they provide a repair that is both waterproof and high strength (structural). Urethane Injection: High solids hydrophobic polyurethane injection resin is designed to seal leaking cracks, voids or fractures in concrete or solid masonry. The 2-part polyurethane is packaged in cartridges and mixed during dispensing. The result is a low viscosity, water activated polyurethane. When the resin encounters water as it is injected into the crack, it becomes an expanding foam that provides a flexible seal in leaking and non-leaking cracks. Cured polyurethane is flexible and tolerates future crack movements well. This repair option is a permanent moisture prevention repair and works with either active or dormant cracks. This is the simplest and most economical means. It can be used for both vertical, horizontal, overheads and curved surfaces. It's a non-structural repair that consists of V-grooving the crack by grinding then filling it with a suitable joint sealant. Materials are available seal both active and dormant cracks. Popular crack repair sealants include epoxies, urethanes, polyureas and polymer mortars. For floors, designers must choose a sealant with suitable flexibility and hardness or stiffness properties to accommodate both the anticipated floor traffic and future crack movements. For dormant cracks, harder sealants are preferred because of the better edge support. For active cracks, flexible sealers are preferred but the load-carrying capacity of the sealant and crack edge support should not be sacrificed. Repairing & Protecting Concrete Structures: Inspection, maintenance, repairs and waterproofing procedures to fend off the effects of weather and wear. Adapted With Courtesy: Maintenance Solutions, October 2003, By James P. Donnelly, P.E., S.E. All buildings require regular maintenance, but parking garages are in particular need of regular attention because they are subject to harsher conditions than most structures. Parking garages are exposed to vehicular traffic and abuse, seismic stresses, moisture and temperature changes from the weather. Parking garages in northern climates and along costal areas also are exposed to salts, which can penetrate into concrete and corrode embedded metal reinforcing. For these reasons, maintenance and engineering managers should develop sound inspection and maintenance programs to protect and prolong the life of parking structures. Corrosion - The Enemy. Common problems: Much of the structural deterioration and failure in typical parking garage faces is due to corrosion of reinforcing and embedded metals. This corrosion results from long-term exposure of the concrete to moisture and chlorides from deicing salts or airborne salt spray. When water and chlorides penetrate into the concrete in sufficient concentrations, embedded steel or other metal begins to corrode. Since corrosion by-products are much larger than the original volume of the steel, they cause expansive forces which results in internal cracking of the concrete. This condition then causes delamination, or loosening of the surface concrete from the concrete below (spalling). Eventually the concrete cracks and loosens to the point where surface concrete falls off or creates surface potholes and exposed rebar. Cracks: Another significant problem with parking structures is cracking of the concrete. Cracks allow a direct path for moisture and chlorides to enter the concrete floor slabs, resulting in the premature initiation of the corrosion of the embedded reinforcing. Cracking in parking structures can be related to applied loads, seismic conditions, thermal expansion, long-term concrete shrinkage and restraint of structural movement. Because parking structures are longer than typical structures, structural movement due to thermal changes or long-term shrinkage of the concrete can result in significant internal forces in the structure if such movement is restrained. If forces are large enough, cracking results. Structural maintenance: This includes repairing and patching areas of delaminated or spalled concrete on floors and ceilings, corrosion protection, sealing joints and cracks in floors, and maintaining protective waterproof coatings on floors. Concrete and rebar repairs: Repairs are required when surface concrete begins to delaminate from the concrete below, resulting in loose or spalled surface concrete. Typically, repairs should extend at least 3 inches beyond the area of delaminated concrete and should be chipped out to at least 3/4 inch below any exposed reinforcing. Concrete patch edges should be sawcut without damaging embedded reinforcing bars. Exposed concrete and steel surfaces in repair openings then should be sandblasted clean. Then all exposed reinforcing bars and tensioning posts should be painted with a protective coating. Once the coating has cured, the repair opening can be recast using concrete patching material. Modern concrete patch materials cure very quickly to enable traffic. Crack and joint sealing: Left unsealed, cracks and joints become easy paths for moisture and chlorides to penetrate into garage floor slabs and expansion joints. So it is important to seal these openings and the keep seals intact over the structure's life. Maintenance personnel should check sealed cracks and joints at least annually and repair to assure the crack sealants and joint seals are still effective. Protective coatings: Once repairs are made, it is important to apply vehicular grade waterproofing systems to protect the structure and minimize future deterioration. Even garages in good condition benefit from the installation of a vehicular grade waterproofing system which limit the amount of moisture and chlorides entering the concrete. Building owners and maintenance managers see that vehicular grade waterproofing membrane systems are applied long before concrete deterioration begins, which greatly prolongs the amount of time until repairs are required. Waterproofing strategies: The choice of a waterproofing system depends somewhat on the condition of the garage and the exposure of the floor. For example, a fairly new garage with minimal chlorides in the concrete can benefit greatly from the application of a penetrating sealer. But this sealer might not be adequate protection for an older garage already experiencing corrosion-related delamination and spalling of the concrete. In a garage having a significant amount of cracking in floor slabs, a traffic-bearing waterproof membrane system probably is appropriate because of its crack-bridging capability. All top level floors should have waterproof vehicular traffic membranes applied. When considering long-term cost, waterproof membrane systems typically are better. Properly maintained membranes can provide 15-20 years of service life. Follow-Up Inspections: Inspection could be limited to a full visual inspection and localized sounding of the concrete for delamination. A more involved evaluation also might include inspection openings, concrete sampling and testing, and structural analysis. A way to make routine inspections more cost-effective is to use in-house personnel to perform intermediate inspections to look for deterioration and distress. This tactic could delay the frequency of the engineering inspections. But managers still should schedule engineering inspections to be performed every three-five years. Inspection to determine whether structural repairs are required by experienced engineer should be as often as every two-three years, depending on the condition and exposure of the structure. Parking garages are unique structures that require regular inspection, maintenance and repair. Managers can minimize deterioration by scheduling regular maintenance, including structural maintenance repairs, perhaps every three to five years, depending on the structure’s condition. If a structure is protected by an effective waterproofing coating, the time between structural repairs increases further. With more than 24,000 parking garages located throughout the United States, there is no denying the important role they play in society. However, as some of the structures begin to age, experience an increase in loads, and suffer the effects of chemical and de-icing salt usage, garages are often left in need of repair and retrofit. This has led many owners to seek cost-effective and efficient repair and strengthening programs – all while trying to manage the challenge of keeping their customers happy with an adequate temporary solution for their parking needs. One example of this scenario is a parking structure that is adjacent to a one million-square-foot mixed-use facility in New York. Despite being subject to an environment that experiences severe freeze-thaw conditions and consistent exposure to de-icing salts, the parking structure was not regularly maintained during its life, which led to a failure at the second supported level. Constructed approximately 35 years ago, the freestanding structure can accommodate 700 vehicles with a gross area of about 200,000-square-feet and is comprised of three supported and one additional on-grade level. Originally constructed using cast-in-place and precast, prestress concrete components, each floor was constructed with precast single-tee beams supported by precast columns founded on cast-in-place concrete piers and spread footings. The six-inch cast-in-place floors were constructed with eight wire button head post-tensioned reinforced concrete and mild steel reinforcement in the temperature direction. Precast concrete spandrel panels comprised the north and south façade, while post-tensioned concrete spandrel beams comprised the east and west elevations. Vehicular access is direct from the street level and pedestrians enter the structure via two stair towers that are connected to the building. Wanting to ensure a cost-effective and efficient process, the owner opted to use a design-build team for the project. Design-build encompasses architecture/engineering and construction services within a single contract, thereby combining the vital roles of designer, constructor, and other sub-consultants. The design-build team began the repair process with a full condition survey of the parking structure that included chloride ion testing, petrographic analysis testing, post-tension probes and chain-drag/hammer sounding. The results of the survey indicated that, overall, the cast-in-place concrete slab was in fair to poor condition. The most critical design challenges were repairing the failed second supported level and all the cantilevered expansion joints. The structural integrity of the second support slab level was fully compromised by the failure of slab button headed tendons. Conventional repair methods would require full removal and replacement of the slab. As an alternative to this invasive procedure, Structural Preservation Systems (SPS) developed an innovative repair strategy that included replacing the existing wire system with a fully encapsulated monostrand post-tensioning system. The construction and tensioning sequence of this repair omitted the need for additional shoring. Each of these elements in the design strategy reduced time and costs, while prolonging the useful life of the structure. The existing cantilevered expansion joints were removed full depth, redesigned and replaced with a highly reinforced short span support cantilevered section. New traffic bearing glands were installed, as well as PTFE slide bearing plates at the bearing seat. Placement of the new expansion joint concrete headers ensured that water would run-off in a direction that was opposite of the expansion joint. Through the use of new post-tensioning technology, monostrands were used to mend the broken button headed tendons that were found throughout the deck. Further, spalls located on the deck were repaired with 5,000 PSI ready mixed concrete. Cracked tee-stems were injected with epoxy resin. Overhead spalls on beams and slabs were fixed using a polymer-modified repair mortar that was applied with an overhead trowel. Then, the entire deck surface was shot-blasted and sandblasted clean for the application of the saline sealer.